As South Florida's Leading Supplier of Helium Gas and Helium Tanks and Cylinders, Broward Nelson is in a unique position to provide Helium customers with secure, reliable supply, along with expert applications support. Helium is a unique, multipurpose molecule—but it is a finite resource and global demand for it is growing. Helium is a critical element in many applications. Broward Nelson understands your need for reliable, worry-free supply. 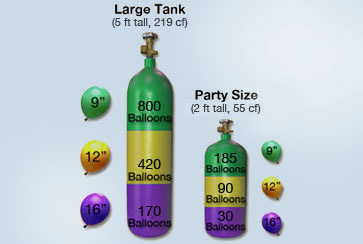 Broward Nelson sells Helium in 280cu ft/ 50 LB Tanks and Cylinders that fill approx 600 - 9" balloons. Helium is ideal for blowing up large numbers of Balloons for any party, special event or grand opening. Helium Regulators (Balloon Fillers) and Helium Nozzles are also available for Purchase with any Helium Tank. Please note that we sell Full Helium Tanks and Cylinders only, we do not fill individual Balloons. Helium is nontoxic and safe to use provided its properties are understood, and it is stored and handled properly. Does Broward Nelson refill Helium Tanks? No. We offer Full Tank Exchanges. We will swap our full Helium tank for your empty Helium tank. Call us at 800.262.8265 with your Helium (He) Tank size (chest high, waist high or knee high) and your city name, and we will let you know when we can schedule to come out (usually Next Day Delivery) or you can come to our location and pick up. I tried to refill my Helium Tank, and they said it needed to be Hydro tested. What is Hydro testing? Hydro testing is done every 5 years on a Helium Tank and it is required to be done by law before any Helium Filler can fill the Helium Tank. Hydro testing ensures that your Helium Tank is safe to use since it will be tested under high pressure conditions. When a Helium Tank goes in for a Hydro test, the main valve is unscrewed from the top of the Helium Tank and then the Helium Tank goes through a testing process in which it is inspected for hairline fractures in the metal. If there are no cracks in the metal, then the Helium Tank passes the Hydro test and the Helium Tank is marked by engraving a date (month-year) into the top part of the Helium Tank. If the date stamp is current within the last 5 years, your Helium Tank is safe for Helium Refilling. If the Helium Tank does not pass Hydro testing, the Helium Tank is marked condemned and cannot be refilled. This may happen if the Helium Tank was damaged in some way. Usually extreme conditions cause this- fires, dropping of the Helium Tank a number of times, also softer metals such as aluminum Helium Tanks and Helium Cylinders sometimes do not pass. When metal has been bent (especially around the top part of the Helium Tank, it starts to weaken the metal). How do I know if I need a Helium if I don't have a Helium Gauge? Keep track of how many bags of Balloons you have used: A large Helium Tank will fill about 160 17" Balloons (about 2 and a half bags of 72 count Balloons) or 420 11" (about 4 bags of 100 count Balloons), so if you have done 2 bags of large balloons or 4 bags of standard size balloons, you are probably close to needing a refill. Watch the speed of the pressure coming out: The pressure will slow down considerably when the Helium Tank is getting low. It will take many seconds to fill the Balloon as opposed to 5-8 seconds (the normal time it takes). When it seems like the pressure has slowed down, this is also an indicator that you may need a Helium. How do I order Helium? Can I transport a Helium Tank in my car? You may transport up to 1000 cubic feet of Helium in your car (a large Helium Tank is a 244 cu. ft.) But be aware that there is a limit. You need to make sure there is a green diamond label sticker on the Helium Tank before you transport it. This label shows Hazmat crews and safety personnel that the Helium Tank has an inert, inflammable gas inside (that it is relatively safe). You should secure the Helium Tank in your vehicle (so it does not roll around). You must transport the Helium Tank with the Helium Regulator detached and the tank cap on. Can I store the Helium Tank in my garage or office or even outdoors? Broward Nelson recommends that you store the Helium Tank in a cool dry place that is protected from the outside and from high traffic areas. You can store the Helium Tank in your garage as long as it is well ventilated when you are using the Helium Tank. You should secure the Helium Tank to the wall or use a stand or dolly to keep the Helium Tank from falling over. We discourage keeping Helium Tanks and Helium Cylinders outside exposed to the elements because rain can cause the Helium Tanks and Helium Cylinders to start rusting. Try to keep the Helium Tanks and Helium Cylinders in a covered area. Always remember that Helium is considered a hazardous material and it is under extreme pressure. Helium Tanks and Helium Cylinders are heavy and can cause injury should they fall. I see a star and plus next to the Hydro test date, what does that mean? Sometimes a star and a plus sign are engraved next to the date. The star means that the Helium Tank can be Filled every 10 years from the date. As South Florida’s Leading Supplier of Helium Gas, Helium Tanks, Helium Cylinders, Helium Regulators & Helium Nozzles Broward Nelson is in a unique position to provide Helium customers with secure, reliable supply, along with expert applications advice and support.